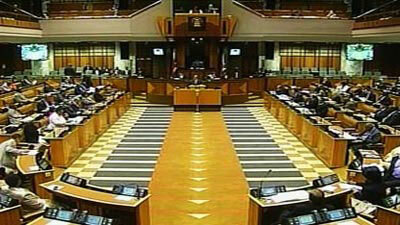 Parliament fails to reprimand "out of order" MPs - SABC News - Breaking news, special reports, world, business, sport coverage of all South African current events. Africa's news leader. Tags: National Assembly, Members of Parliament, Executive membersu2019 code of ethics. The House has now adjourned without carrying out the sanctions. Parliament’s Joint Ethics and Members’ Interest Committee came in for criticism in the National Assembly’s Programme Committee recently. This comes as the committee has not been able to meet regularly to finalise most of the complaints against MPs who have breached the Code of Ethics. Some of the outstanding complaints include those submitted by Democratic Alliance (DA) Chief Whip, John Steenhuisen, in 2016. The ANC Chief Whip Jackson Mthembu was also not impressed. The Joint Ethics and Member’s Interest Committee has recommended that ANC MP, Nyami Booi‘s salary be docked for 45 days and that he be reprimanded in the National Assembly. This comes after Booi breached the code of ethics for not declaring that he had received a monthly salary of 60-thousand for additional work since December 2015. The complaint was lodged in May 2017 by DA MP, James Lorimer. Public Service and Administration Minister and ANC MP, Ayanda Dlodlo, has also been found guilty of breaching the code of ethics. This comes after she failed to declare that controversial businessman Fana Hlongwane paid for her stay at the luxury Oberoi Hotel in Dubai in 2015. Following an investigation by the Committee, it recommended that Dlodlo be reprimanded in the National Assembly, ordered to rectify the breach and be counselled on the requirements of the code. The House has now adjourned without carrying out the sanctions. There are many other outstanding cases. The Joint Ethics Committee will be back in Parliament on the 4th of April to conclude its Legacy report. Co-chairperson, Humphrey Maxegwana, says both outstanding and finalised cases will be included in the Legacy report, which will be dealt with in the sixth Parliament. National Assembly Members of Parliament Executive membersu2019 code of ethics. This entry was posted on 22 Mar 2019,05:43PM at 5:43 PM and is filed under Politics, News, Homepage Featured Story Slider. You can follow any responses to this entry through the RSS 2.0 feed. Both comments and pings are currently closed.